The airport is forecasting that April will mark the first time the airport serves 17 million passengers in a 12-month period. The milestone coincides with LLA’s busiest Easter weekend, with 58,048 passengers expected to use the airport on April 18 alone. Popular destinations over the Easter period will include Warsaw and Barcelona, which are expected to overtake Geneva and Tel Aviv to enter the top five alongside Budapest, Bucharest and Amsterdam. The addition of more flights by Wizz Air to Warsaw and a recently-introduced new route to Barcelona operated by Ryanair helped to encourage growth to these cities. 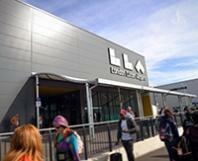 London Luton’s chief executive Alberto Martin said: “The first three months of 2019 has been a record period for LLA and passengers have been experiencing the benefits of our transformation which was completed in December.